In 1974 a new Doctor made his debut - a big moment, but familiar territory for Doctor Who fans who'd already seen the elderly, irascible William Hartnell become the mercurial trickster Patrick Troughton become the haughty, heroic Jon Pertwee. No one knew then that Tom Baker, the latest successor to the title, would become the most famous Doctor for two generations - but that didn't stop the production team from throwing all their efforts into giving him a memorable debut foe. 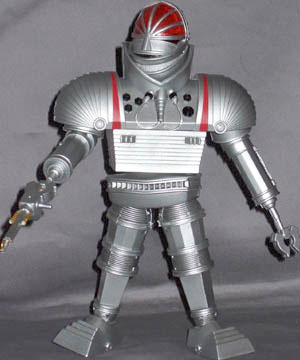 Standing over eight feet tall, the K1 was a large, powerful and intelligent robot built by Professor Kettlewell from living metal. Designed to perform jobs too hazardous for men, the K1 robot had a prime directive that prevented it from harming any human, even if ordered to do so. Capable of tunnelling through ground, smashing open armoured doors and tearing apart high-voltage electric fences, the robot would be deadly in the wrong hands. Unfortunately the sinister Scientific Reform Society reprogrammed the robot forcing it to steal top secret plans for a powerful disintegrator gun and kill. The conflict between obeying its new orders and its prime directive caused an imbalance in the robot's neural circuits. Becoming confused and deranged the robot caused havoc taking Sarah Jane Smith prisoner. When a blast from the disintegrator gun was absorbed by the robot's living metal body, it grew to gigantic proportions and was reluctantly destroyed by the 4th Doctor using a metal virus. The K1 robot - known colloquially as the Giant Robot, for reasons pretty obvious from the above bio - may look a bit hokey, but just remember: 1974. And: BBC. This chrome-plated behemoth, not to mention the visual effects work required to represent its eventual size, represented an almost unheard-of outlay of budget for the perpetually cash-strapped show. 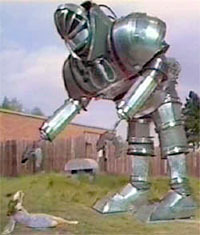 With the best the poorly-funded but hard-working costume department could provide stacked atop the 6'7" frame of Michael Kilgarriff (who had already played the Cyber Controller in 1967's "Tomb of the Cybermen," and would reprise the role in 1985 in "Attack of the Cybermen"), the Giant Robot was a formidable presence, and an enduring image in the collective consciousness of fans. Befitting its stature, the Giant Robot is no mere carded figure, but instead is Character Options' first build-a-figure, with pieces accompanying the eight (and a half) regular figures in the initial Classics series in their Doctor Who line. 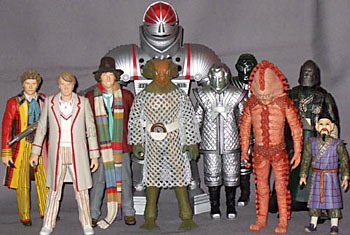 Collecting the Zygon (head), Fourth, Fifth and Sixth Doctors (hips, left arm, and upper torso respectively), Sea Devil (mid-torso), Magnus Greel and Mr. Sin (right arm and disintegrator ray), and SV7 and D84 "Robots of Death" (right and left legs) nets the complete K1, and assembly is straight-forward, though irreversible. 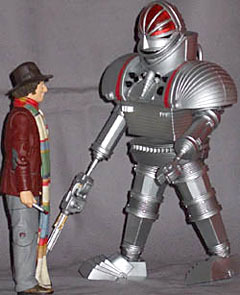 Even before being zapped to gigantic proportions, the K1 costume - built to sit high up on top of Kilgarriff's already tall shoulders - towered above its human co-stars, and the figure is an appropriately lofty 7½" tall, humans in the Doctor Who line being 5"-5½" generally. 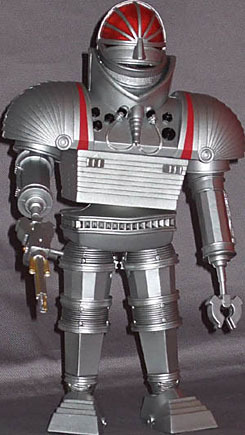 Robotics in the 70s meant shiny silver, and the K1 was no exception, so the figure is almost entirely cast in colour - however, as with the earlier Daleks and Cybermen, the K1's finish is very smooth and regular, very reminiscent of its on-screen appearance and free of the surface imperfections that often mar toys using metallic-look plastics. Black and red paint provides accents around the chest and shoulders, along with clear tubes in front and back, while the ribbed knee and ankle joints have been given a gentle black wash to darken their recesses. 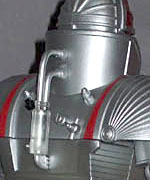 Since the costume was built to augment the actor's height, the top half of the head is empty (Kilgarriff's head reached up just far enough to see through the robot's mouth), a feature showed off by the translucent forehead to give a glimpse of the robotic brain within; the figure doesn't have internal blinky lighting, of course, but the honeycomb-textured clear red plastic is just obscure enough to give roughly the same effect - you can see in, but not clearly. The eyes and mouth grill are both painted black, and the silver bands over the forehead are painted in clean silver that matches the cast plastic perfectly. Articulation over the Doctor Who line is acceptable but not hugely ambitious; the K1 shoots high though, with a collection of joints that probably make it a lot easier to pose than the real thing was; certainly less effort. The neck is a proper three-axis balljoint, as is the waist; the shoulders beneath the big shrouds are swivel/pin, as are the elbows, while the legs have swivel/pin hips, balljoint ankles, and peg toes, ratcheted to either sit flat, or be bent upwards to allow the robot to stride forwards. There are no knee joints - the sculpt more or less prohibits anything useful there - but the K1 did tend to lurch rather, so this isn't much of a drawback. The robot has one accessory, the disintegrator ray, a rifle-sized weapon that looks smaller in its sizeable grasp. The claws (including the thin "wrist") are softer plastic, allowing the back of the disintegrator to be slid firmly into place in its grip; it's cast in silver, with gold paint detailing. I'm told that the Australian distributor that had been bringing the Doctor Who line to our shores has recently dropped the line, which is a hell of a shame - there may be two or three more David Tennant variants than strictly necessary doing the rounds, but along with them have come a huge variety of characters and creatures, all manufactured with impressive attention to detail, and with the broadening of the line beyond the new series, into the eras of the first eight Doctors, the fan-pleasing potential literally knows no bounds. The Giant Robot serves admirably as the first classic build-a-figure - it's big, versatile, and accurate, and plenty of reason to buy the whole set, rather than just cherry-pick your favourites. From now on it seems online shopping will be the only avenue for Australian fans to get their Doctor Who action figure fix - and if they keep being this good, I'll be among them.